﻿﻿ www.unuudur.com » A Revival of the Mongolian-Russian Friendship? A Revival of the Mongolian-Russian Friendship? On the eve of Russian Prime Minister Dmitry Medvedev’s visit to Ulaanbaatar, Mongolia, for the 11th Annual Asia-Europe Meeting (ASEM) summit (July 15–16), an article appeared in the Russian media entitled, “ ‘An Old Friend is Worth Two New’: It’s time for Russia to turn towards… Mongolia” (Fort-russ.com, July 9). The piece examined the weakened state of Russian-Mongolian relations in the post-Communist era and called for Russia to return to its position of influence in a country once firmly tied to the Soviet sphere and often called the Soviet Union’s 16th republic. In 2016, already there have been signs that the Russian government is moving in this direction: in February, Moscow decided to grant Mongolia $1.3 billion in new loans to import Russian fuel (The UB Post, February 5); in March, the Russian Federation wrote off Mongolia’s $174 million debt after a one-off payment of $3.8 million (The UB Post, March 2); on June 23, Mongolian President Tsakhia Elbegdorj’s “Economic Corridor” initiative was finalized at the Russian-Mongolian-Chinese trilateral meeting on the sideline of the Shanghai Cooperation Organization (SCO) summit in Tashkent (Mongol Messenger, June 24); and on June 28, Russian-owned shares in the Erdenet copper mine and mining firm Mongolrostsvetment were suddenly mysteriously sold off to a newly formed Mongolian company (Mongol Messenger, July 1). Such warming trends in Mongolian-Russian relations are likely to accelerate, particularly following the June 29 election of a new Mongolian government, which saw the return to power of the Mongolian People’s Party (MPP)—a political faction with socialist-era roots as the country’s Soviet-supported Communist party. Earlier this year, Mongolia asked the Russian Federation for $1.3 billion in loans over a 36-month period to meet its domestic fuel demands, especially in the mining industry. This deal would finance the purchase of 1.3 million tons of fuel annually and decrease domestic price fluctuations for retail fuel, while stabilizing prices for staple goods and resolving pressure on Mongolia’s foreign currency reserves. In June, the Russian VTB Bank, supported by the Russian Agency for Export Credit and Investment Insurance (EXIAR), issued the first $65.4 million of a $300 million line of credit to the Development Bank of Mongolia (DBM), under governmental guarantees of Mongolia’s Ministry of Finance (Mongol Messenger, July 1). Mongolia’s outstanding $174 million debt to Russia—which has now been forgiven—had been an impediment to deeper investment cooperation in Mongolia’s construction and mineral production markets. A 2010 deal between Moscow and Ulaanbaatar took six years for the Russian legislature to approve (Sputnik News, January 31, 2016). Another looming problem since 2009 involved the terms of an intergovernmental agreement for rail transportation of Mongolian exports via Russia (Mongol Messenger, June 24, 2016). The draft was finalized by the outgoing Mongolian cabinet and signed by Russian and Mongolian officials at the Tashkent Summit as part of the trilateral Russian-Chinese-Mongolian “Economic Corridor” program. The economic integration of the major infrastructure projects in Northeast Asia—Mongolia’s Steppe Road, China’s One Belt and One Road Initiative, and Russia’s trans-Eurasian transit corridor—is considered by Ulaanbaatar to be the first concrete outcome of the past three years of tripartite talks. After 17 working group meetings, a total of 32 selected projects were divided into 13 categories: railway infrastructure, the AN-3 Asian auto road network and eastern auto road, airlines, industry, energy, the renovation of border checkpoints, trade, specialized customs inspections and quarantine measures, environmental protection and ecology, scientific and technical partnerships, humanitarian cooperation, agriculture, and medicine. Although funding must still be clarified, the three sides agreed to establish a co-financed Investment and Projecting Center. Further studies will also be conducted regarding the construction of a Moscow–Beijing high-speed railway line through Mongolia; establishing an economic zone through Heilongjiang, Russia, Mongolia and Inner Mongolia; and renovating the Russo-Mongol electrical network. All these projects are designed to deepen trilateral economic cooperation and regional economic integration, increase trade flows, maintain trade competitiveness, as well as enhance trans-border transportation. This plan will also establish trans-border ecological corridors to enhance tourism, including a “Triangle of Great Lakes” involving Mongolia’s Khuvsgul Lake, Russia’s Baikal Lake and China’s Hulun Lake, and create a “Great Tea Road” tourism brand (Mongol Messenger, July 1). The day before Mongolia’s election, then–prime minister Chimed Saikhanbileg announced that Russian Rostec had sold its 49 percent share in the Mongolrostsvetment and Erdenet joint ventures. The latter is a giant ore mining/processing site that produces 530,000 tons of copper concentrate and 4,500 tons of molybdenum concentrate per year. The sale, estimated at $500 million, was to Mongolian Copper (Mongoliin Zes), a new private company funded by Mongolia’s Trade and Development Bank (TDB). Because the details were not released, the sale was immediately decried by the MPP as evidence of governing party corruption and an issue of national security. Some independent Mongolian economic analysts, such as Dugar Jargalsaikhan (a.k.a. Jargal de Facto), opined that the non-transparent transaction was repudiated by the Mongolian people and may have provoked the MPP’s unexpected landslide victory. It was claimed that the address of record for the purchasing corporation was the same as for Bloomberg TV News Mongolia, which is a partnership between Bloomberg Media Group and TDB (Mongolianbusinessdatabase.com, July 13). Purportedly, despite the strong opposition of some in the Russian foreign ministry, President Vladimir Putin himself was persuaded to allow the deal to go forward (Ocnus.net, July 14). This sale could also have been part of a Russian maneuver to compensate Mongolia after Moscow (in June) successfully pressured China to withhold Asian Infrastructure Investment Bank (AIIB) funding for Mongolia to construct the Egiin Goliin Hydropower Plant. Russians believe this dam would threaten Lake Baikal, 580 kilometers downstream. At the Tashkent Summit, President Putin said the proposed hydroelectric plant would create “serious risks” to the water supply in the Irkutsk region, but he proposed “increasing the supply of energy” to Mongolia, which annually relies on $25 million worth of electricity imports from Russia (Bloomberg, July 11). 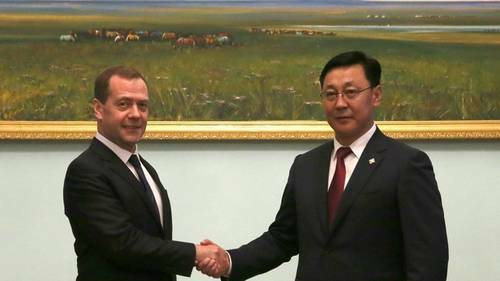 New Mongolian Prime Minister Jargaltulga Erdenebat, a former finance minister and governor, met, on July 15, with Medvedev on the sidelines of the ASEM summit to discuss boosting the Mongolian-Russian strategic partnership in the medium term (Montsame.mn, July 16). The new government and parliament, solidly in MPP hands, will likely try to shift the ownership of Erdenet to a different entity, one not closely connected with the former ruling coalition, as well as seek other international funding options for the Egiin Goliin Hydropower Plant. However, the MPP, known for its pro-Russian leanings, will certainly welcome a more active Moscow as a partner in the Mongolian-Russian-Chinese trilateral format and in a revived bilateral relationship.